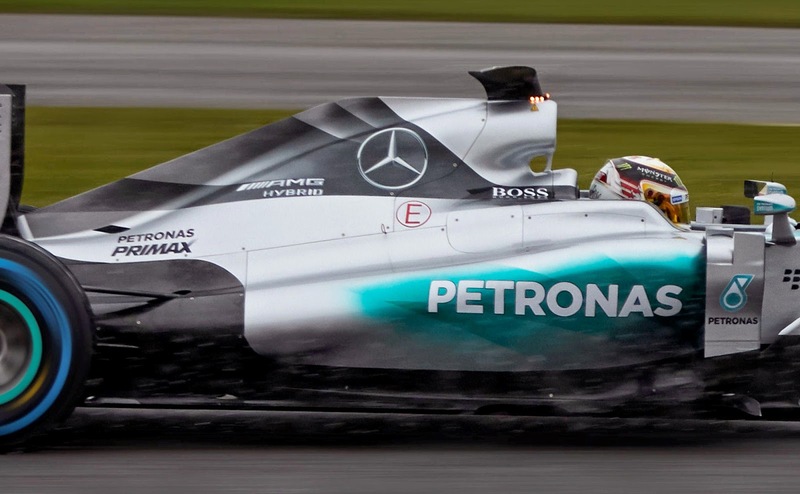 Mercedes arrive in 2015 with a target painted on their back, having led the way throughout 2014. 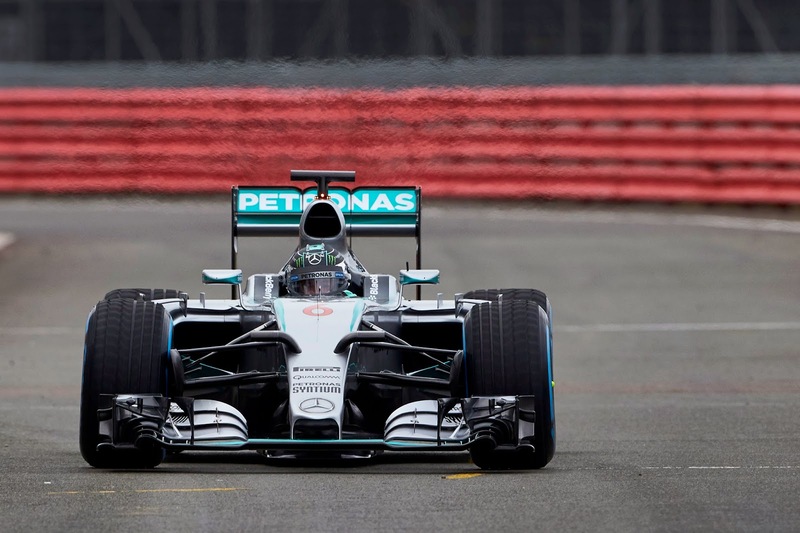 It's still widely regarded they'll continue to lead the way and with good reason, the W05 was an astonishing car when compared with the rest of the field. 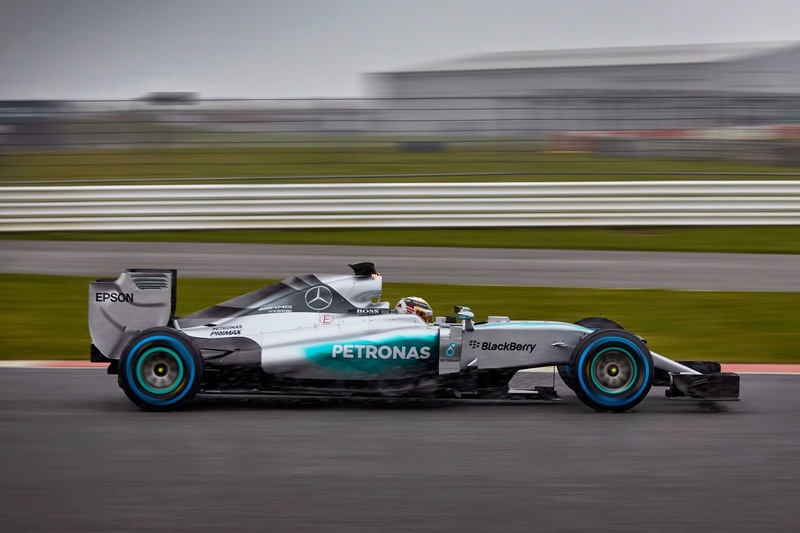 Development in F1 is relentless and although the W06 is an evolution rather than revolution, 90% of the car will have changed, making for a more efficient machine. As per the regulation changes the team had to redesign the nose and like Lotus have opted to use the widest (140mm) but shallowest 9000mm2 cross section at 50mm behind the nose tip (yellow) that the rules permit. Whilst the 20000mm2 cross section 100mm behind this allows for not only a smooth transition of the noses upper surface but also allows for expansion under the nose (like a Venturi). The nose itself is the shortest the regulations permit at 850mm putting the neutral section ahead of the nose, meanwhile the connecting pylons flank the 140mm nose section with the first 50mm of the nose shaped to increase the tip height, bringing fresh meaning to turning you nose up at someone. 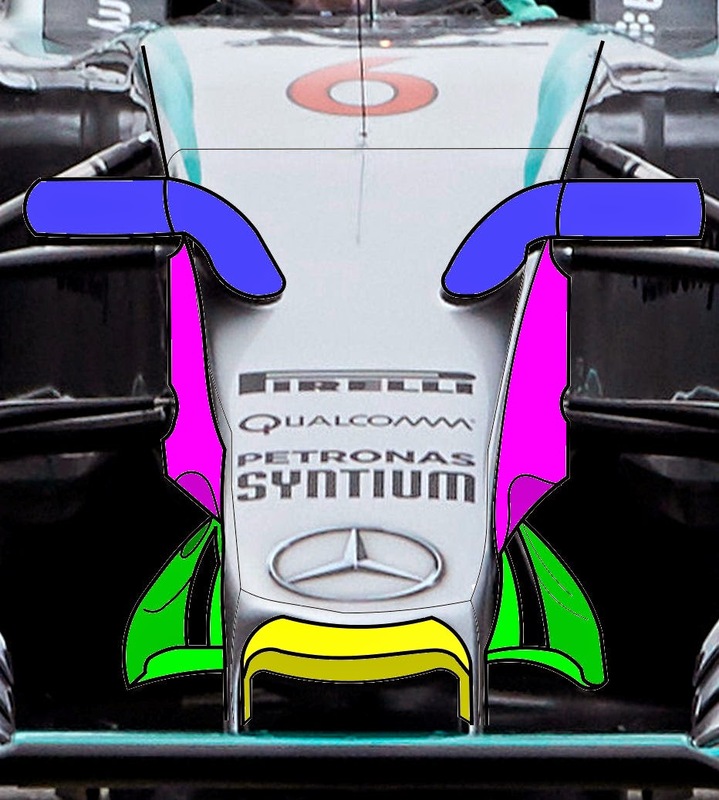 The nose tapers outward to the chassis behind (purple), of which the most forward section of the chassis starts the slope down to the nose, a trend started with the W05 but increased with the W06. This allows the team to retain the handlebar configuration on which the FOM cameras are placed (blue). 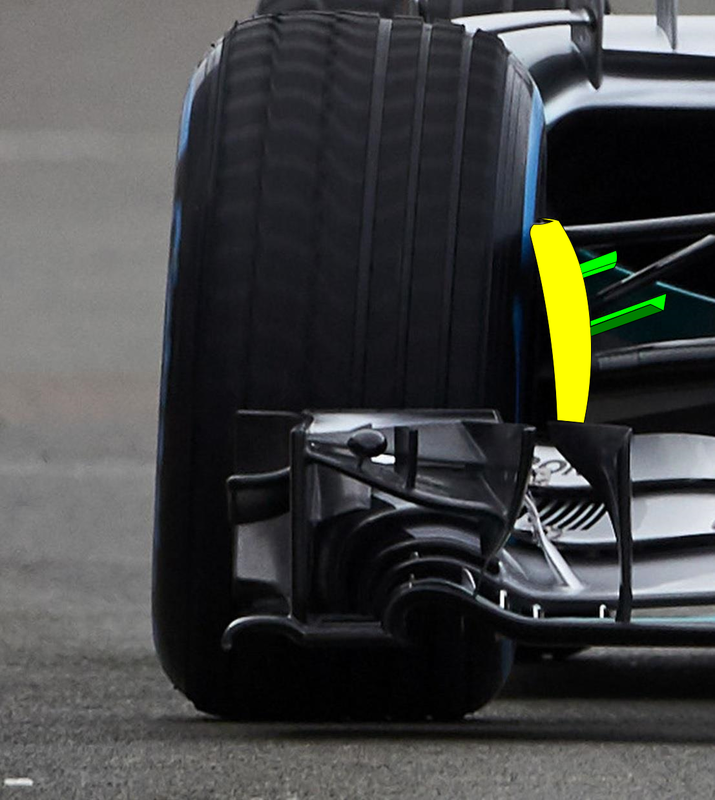 The narrowing of the nose means that from the front view the turning vanes (green) now appear to stick outward but still run parallel to the centreline, dealing with not only oncoming airflow but wheel wake and how the two interact. 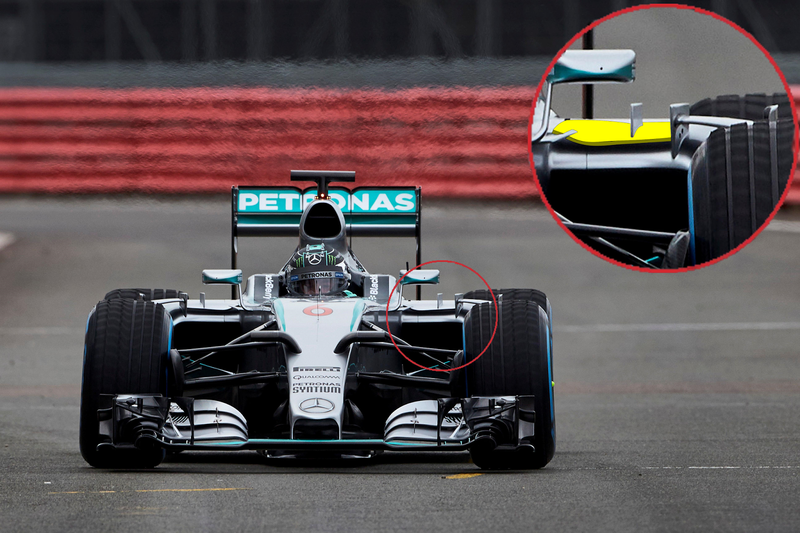 The Sidepods inlets seem to allow for a slightly deeper undercut, whilst this test car also has a new arrangement on the upper leading edge, reminiscent of last years vortex generators, cockpit fins and airflow conditioners configuration the team have now also added a leading edge slat that's mounted between the cockpit and outer vortex generator, whilst the inner one mounts upon this. The idea of the slat is to compensate for the sidepods shape change downstream, mitigating any additional boundary layer build up or lift being generated throughout the speed range. The rear of the Sidepods feature the same elongated outlets (past/through the suspension elements) the latter spec ran by the team featured. However the geometry of the section just before the suspension allows for a larger undercut into the coke bottle region, whilst the upper surface now aligns more closely with the upper wishbone. Perhaps taking some cues from their buddies over at Williams the team have also managed to slim down the engine cover, increasing the size of the shark fin. The small outlets placed along the spine of the engine cover find a new home slightly further back / lower than before, most likely due to the re shaping of the engine cover. 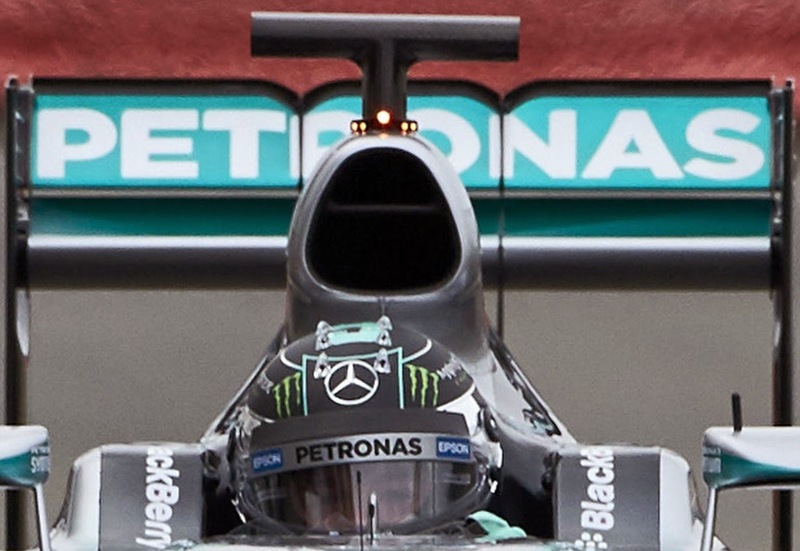 The airbox and roll over hoop has seen some amendments with the central airbox inlet and ad-hoc airbox ears that the W05 used throughout 2014 making way for an enlarged airbox inlet which is horizontally split into two, with the upper duct likely feeding the oil coolers the ears once took care of. The roll hoop has been on a diet with the twin spar arrangement making way for a slimmer singular one. I'm quite sure we'll see more changes to the W06 ahead of the season opener in Australia so as always keep your eyes peeled on the blog as I'll keep you updated with any developments.